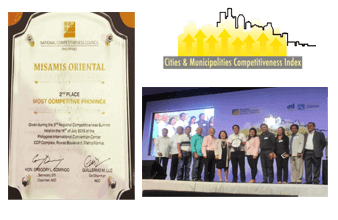 * The Province of Misamis Oriental was not nominated to the annual search of PCCI for the Most Business Friendly Award in 2016. Nominees must pass qualifying indicators in the areas of investment promotions, compliance to the Anti-Red Tape Act, and fiscal transparency. Provincial rankings are based on population and income weighted average of the Overall scores of cities and municipalities under a province. 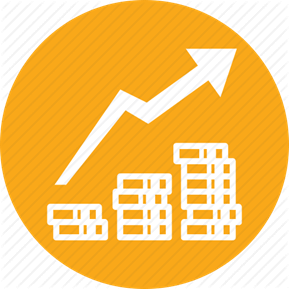 Existing competitiveness indicator systems were used as guidelines in forming the framework behind the Index. Three convergent pillars were found among the most common key indicator areas: Economic Dynamism, Government Efficiency and Infrastructure. The framework integrates these pillars of local economic development and competitiveness up to the regional, national, and global levels. 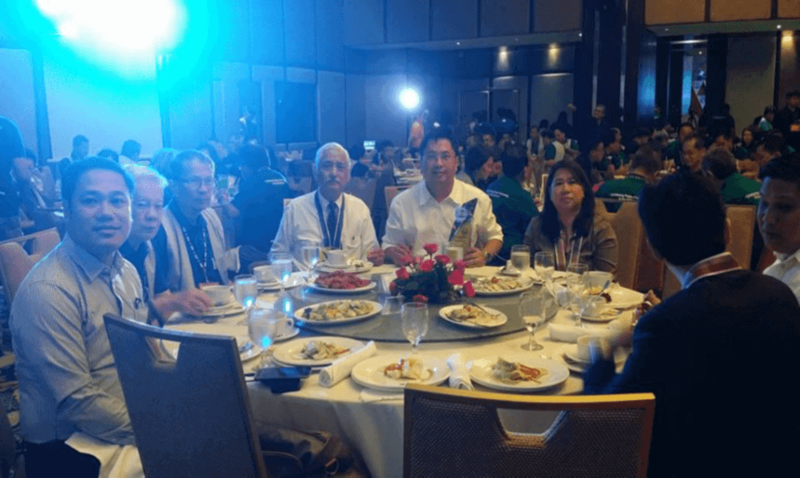 The Province of Misamis Oriental is a major contributor to the regional economic growth and development. The Gross Regional Domestic Product (GRDP) was P367.1B, with the service sector accounting for 40.7%; followed by agriculture and industry with 31.4% and 27.9%, respectively. In the last 10 years, the highest DTI-monitored investments in Misamis Oriental amounted to more than PhP16 Billion, with an average of PhP8.8 Billion annually or an average of 49.07% of total investments in Region 10. The Local Economics and Investments Promotions Officer (LEIPO) To fully support the implementation of the DILG Memorandum Circular No. 2010-113, Hon. 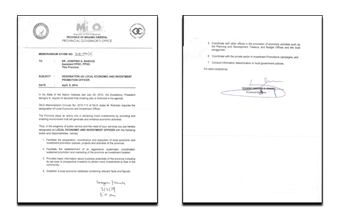 Governor Yevgeny Vincente B. Emano appointed Dr. Josefino S. Bascug, thru Memorandum Order GYVBE No. 2014-577A dated 08 April 2014 as the Local Economic and Investment Promotion Officer (LEIPO) of the Provincial Government of Misamis Oriental. The LEIPO provides technical and administrative support and is responsible in facilitating, promoting and ensuring local economic development to secure opportunities on economic and business development, increase local employment and help reduce poverty. The LEIPO reports to the Provincial Governor with the main function to facilitate the preparation, coordination, and execution of local economic and investment promotion policies, projects, and activities of the provincial/city/municipal government. In compliance to DILG JMC 2011-01, Misamis Oriental is on the process of updating its Local Investment Incentive Code since 2016. 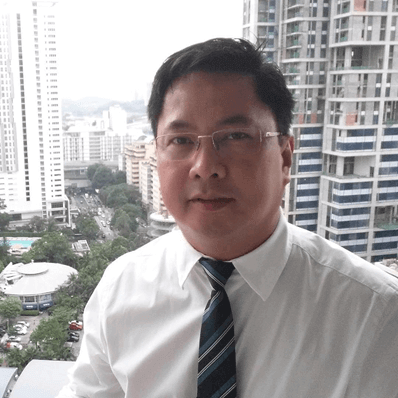 While the series of formulation workshops for the new LIIC, SP Ordinance No. 875-2006 would remain as the province’s guide for its policies and programs in the local investments climate. The Local Investment Incentive Code of the Province of Misamis Oriental, SP Ordinance No. 875-2006. 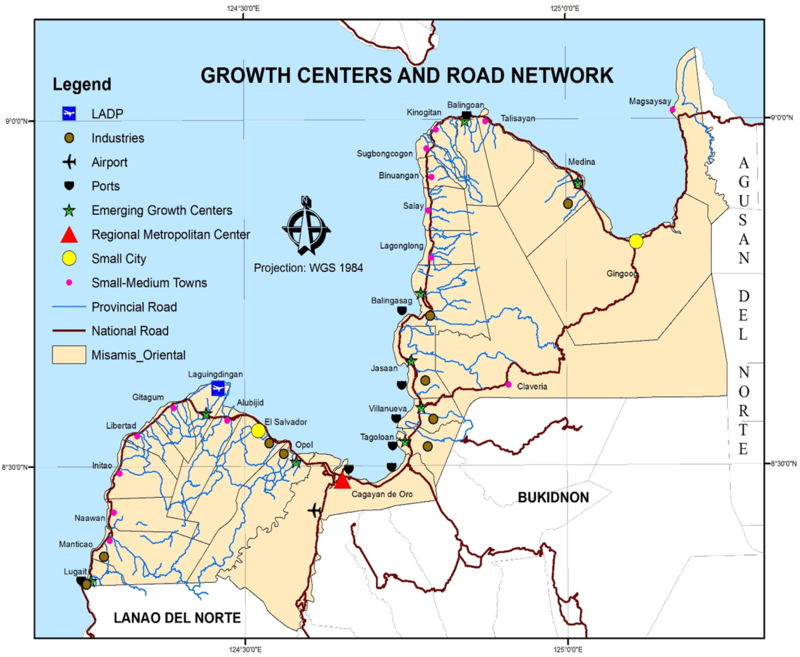 The 2017 Annual Investment Plan or program of the Province of Misamis Oriental refers to the annual slice of the Provincial Development Investment Program (PDIP), 2014-2019 which constitutes the total resource requirements for all programs, projects and activities (PPAs), i.e., the annual capital expenditure and regular operating requirements of the LGU with adjustments in the context of the yearly situation re budgetary constraints , sources of funds, additional projects and other related circumstances. It contains all the PPAs to be implemented in the year 2017 that are in line with the policy thus and strategic direction of the Governor Yevgeny Vincente B. Emano’s Administration in the next three years as derived from the recently Updated Strategic plan for 2017-2019 in the context of the Provincial Development and Physical Framework Plan 2013-2018. 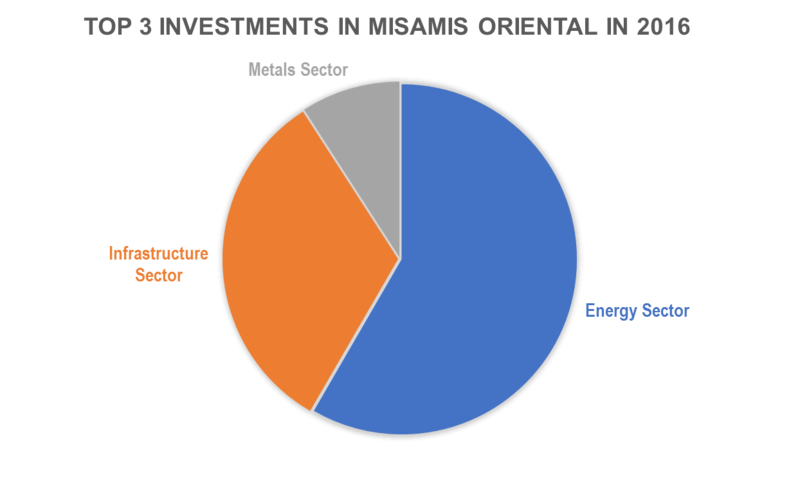 There were seven (7) sectors of investments that contribute to the economic dynamism of Misamis Oriental led by the Energy Sector with a total investment of PhP 7,351,010,000.00. This was followed by the Infrastructure Sector with investments of PhP 4,097,670,000.00 last year. Third ranked is the Metals Sector with investments amounting to PhP 1,148,950,000.00. The Agriculture Sector lagged behind last at number seven (7) with investments only amounting to PhP 60,850,000.00. 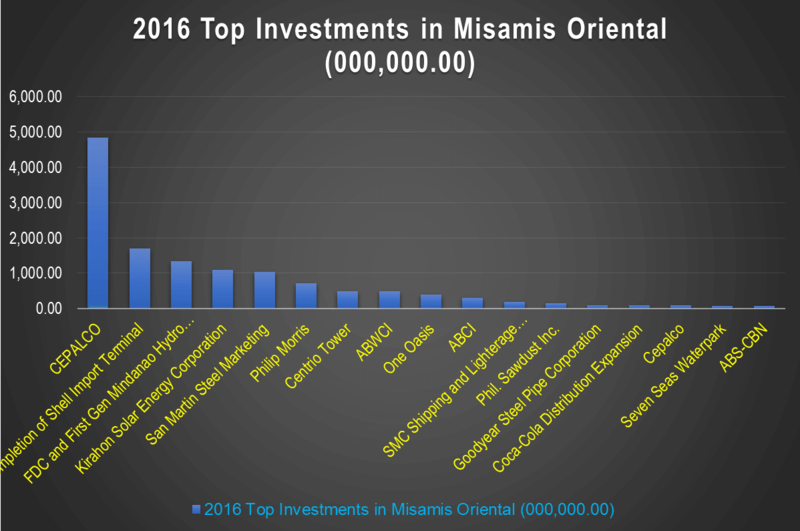 For the year 2016, the total investments in the Province of Misamis Oriental amounted to PhP 13,768,530,000.00. 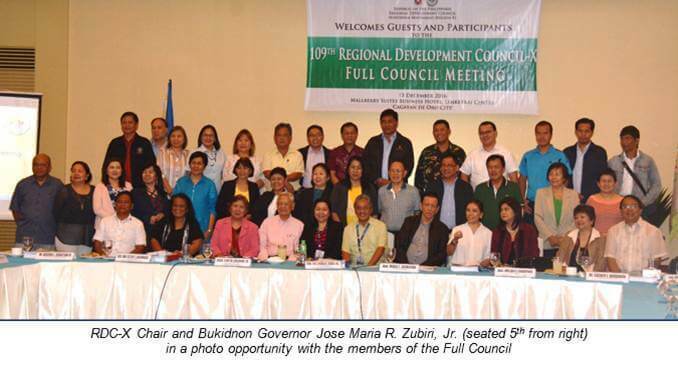 The 2017-2022 Regional Development Plan (RDP) for Northern Mindanao was presented to the Regional Development Council of Region X (RDC-X) during its 109th meeting on December 15, 2016 at the Mallberry Suites, Cagayan de Oro City.